With the new OFF- blade EXCALIBUR the manufacturer der-materialspezialist designed a top class offensive blade. EXCALIBUR combined following characteristics: - high speed and perfect control - maximum disruptive effect and extreme spin reversal by using long pimples or ANTI - soft touch and perfect sound - extreme light construction - high quality and singular design EXCALIBUR offers a perfect attacking play with topspin or shoot in all game situations. 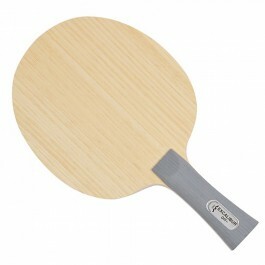 At the same time this blade is perfect for an aggressive playing attitude with ANTI or pimples. EXCALIBUR the new weapon for attack dynamically and effectively with long pimples , ANTI or normal rubbers.